New York is a funny town. For every chain restaurant business that opens up like a Chipotle, Starbucks, Steak ‘N Shake or American Apparel there is also some new local business that opens up as well. Let’s call it the Theory of Restaurantivity; For every chain restaurant opening, there is an equal and opposite local restaurant opening. It’s incredible seldom to see a local restaurant take the place of a chain and even though the opposite is probably more true and likely to happen, it does. Such was the case when Pops of Brooklyn (from Williamsburg) opened their 2nd location in place of a failed Johnny Rockets on 8th Street in the Village. Pops of Brooklyn, the local neighborhood short order diner from Williamsburg has brought their casual dining experience to Manhattan … and in the place of a now defunct Johnny Rockets. 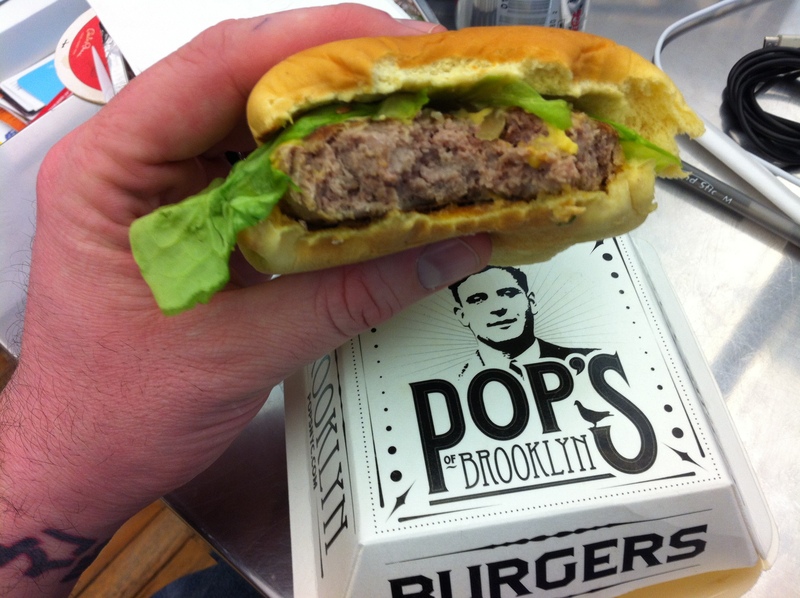 Pops is known for serving Burgers with meat from Pat LaFrieda as well as Dogs & Cheesesteaks at an affordable price. Order your food delivered, pick it up to go or pop a squat at a table or at the bar and eat in. Either way, you’re bound to kick up a friendly conversation over a Beer or Milkshake while you watch your Burger being made through the grill window. It’s the perfect kind of restaurant for the NYU neighborhoodit’s located in. 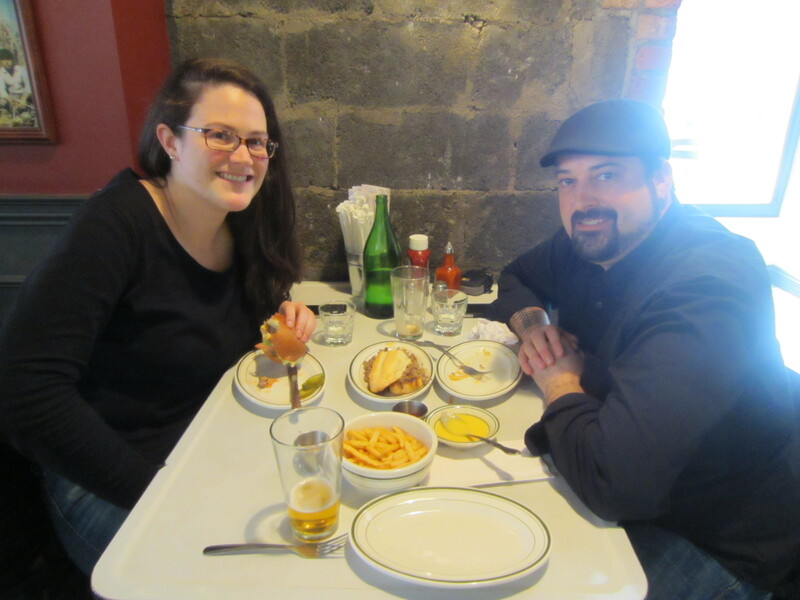 I’d been promising by good buddy Caroline that we would meet up for a lunch Burger every since she started the graduate program at NYU and so today, it was the perfect location to make good on that promise! Whomever was running the Pops of Brooklyn Twitter account did a great job. The reason I know about this place was due to a run of tweets @ me, inviting me out to eat Burgers. That’s some great Social Community. May the power of Social Media compel you. I put that in past tense however because as soon as we decided to go, I posted a bunch of tweets, none of which were replied to. That’s NOT great Social Community. 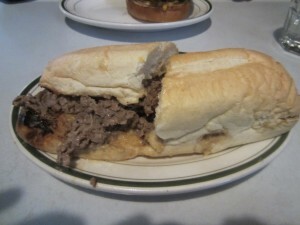 None the less, I was excited to try the Burger and the Cheesesteak which I had heard many great things about. 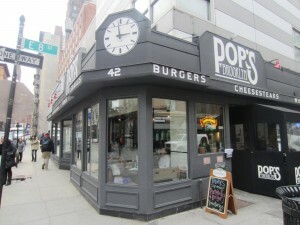 I ordered a Pops Burger, Junior; a 5 oz Black Angus Cheese Burger served with Lettuce, Tomato, Grilled Onions & the Pops of Brooklyn Thousand Island Dressing. We also got an order of Cajun Fries and a Cheesesteak wit’ extra whiz & onions … the ONLY way to properly order a proper Philly style Cheesesteak. 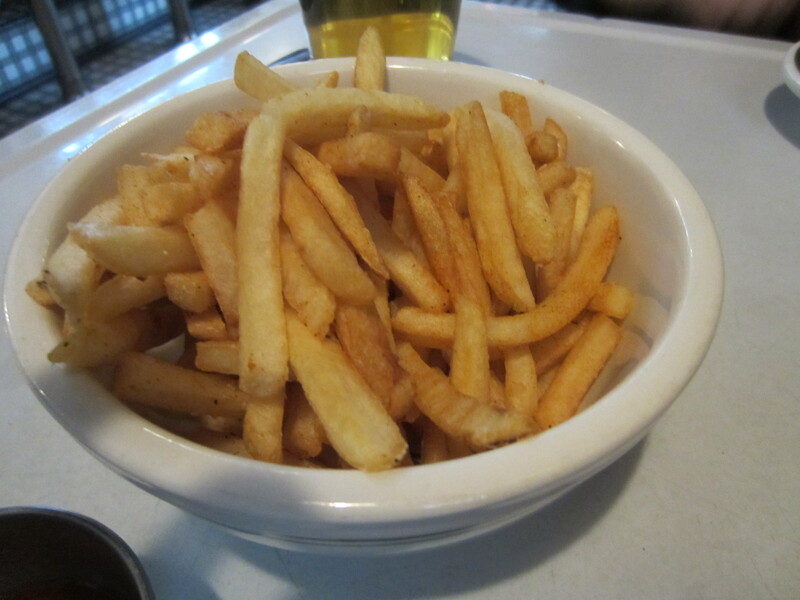 Let’s start with the Fries; whomever designed these was trying to be as close to a McDonald’s French Fries as possible. They’re close but the best part was the Cajun ketchup which was relatively spicy and pretty good. Pat LaFrieda has the best Meat in the city and in general, putting his name on your menu is like saying you have the Stanley Cup on display in your restaurant. People who like hockey, or in this case Burgers, are sure to come by to check it out. 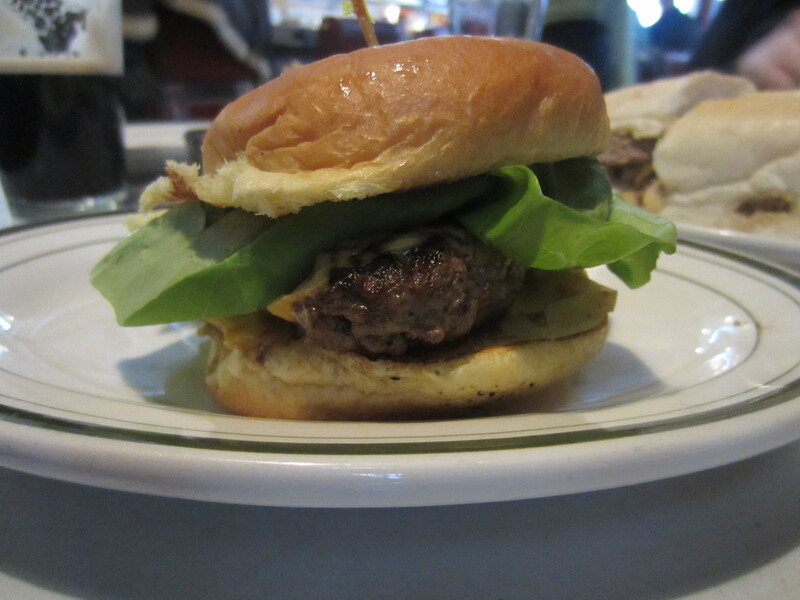 The Burger, served on a Potato Roll with a large and fresh piece of Lettuce looks A LOT like a Shake Shack Burger. Well, let me confirm, it tastes like one too. The fresh ground Beef patty is cooked to a medium (as close as they can get to medium rare) and almost as soft as the roll that it comes served in. 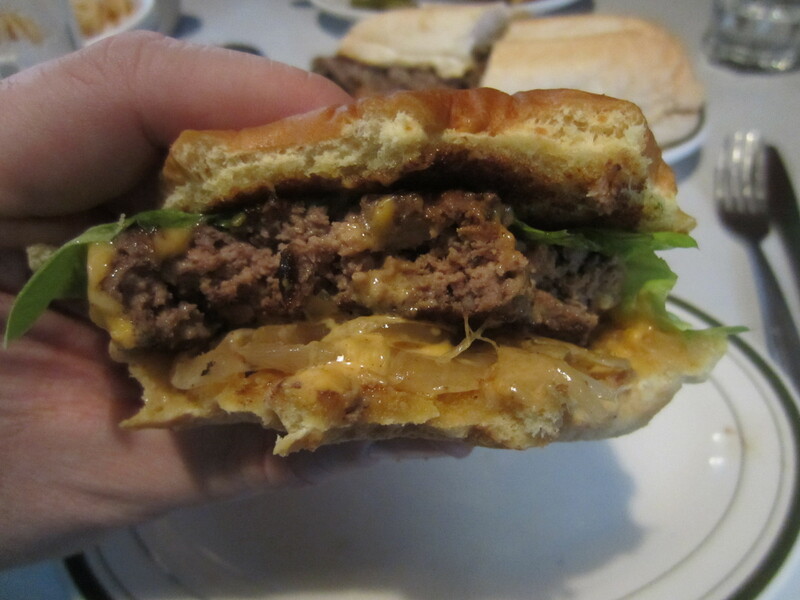 The Cheese was melted just right and the Grilled Onions add just the right amount of sweetness. The Thousand Island Dressing was tangy but applied in very sparring amount so as to only add to the flavor of the Beef, not take attention away from it. I really liked this Burger and you can bet I will be back to eat it again, especially since it’s so close to my office. Now, let’s talk Cheesesteak. Lovers of this sandwich know two things, 1. they have a favorite purveyor in Philly (I SWEAR by Jim’s of South Street) and 2. the further the distance you are from Philly, this less likely you’re going to get a Cheesesteak like the one of your dreams. So ordering one is always, always a gamble. When ours came to the table, I immediately pulled back the Bun to inspect. 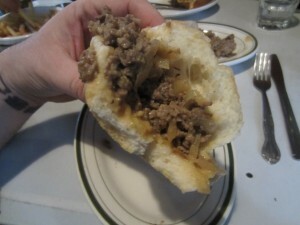 There was a serious lack of onions and those that were there, didn’t have the browned look that gives them the sweet and peppery flavor that makes a great Cheesesteak. 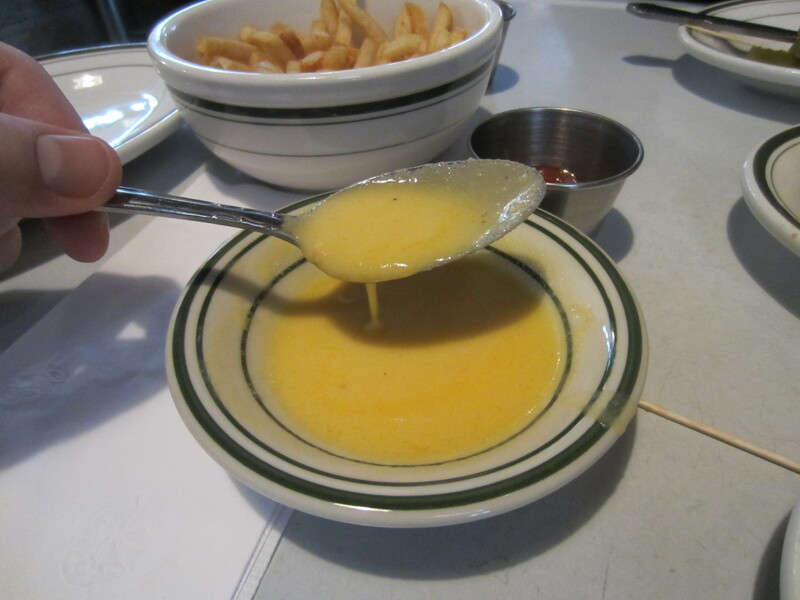 More importantly, there was a serious lack of Cheese Whiz. In fact, I had to ask our waitress if there was any on the sandwich at all. She said yes and then asked if we wanted more. I gave her the benefit of the doubt and maybe she mistook my asking for “extra” Whiz to mean “easy” on the Whiz. She brought us a bowl and thats when I realized what the problem was, it wasn’t Cheese Whiz at all. It some watered down Cheese like substance that in no way had the taste or consistency of Cheese Whiz. I spooned a bunch onto the Cheesesteak hoping it would work. I took a bite and noticed the insides of the Bun had been toasted. There was no way I was going to like this Sandwich regardless if it was actually “good” or not. The point is I like my Cheesesteak a very, Very, VERY specific way and unless you can at least get close, it just won’t do. 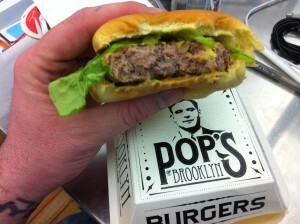 Go to Pops of Brooklyn and get the Burger. It’s really good, fresh, made well, served quickly and all at an affordable price. Or talk about it so much that your office mates decide 2 days later that they have to have this Burger and rally up a lunch delivery order. Yup, it happened and I decided to try something different and ordered the Turkey Burger. It was a mistake. It was dry, not all that flavorful and in general was not nearly as awesome as the Beef Burger. I’m also willing to bet they’re better there as opposed the Burger that took over an hour to be delivered to us. Plus, if you eat at Pop’s, you can always walk down the block afterwards and grab a growler of the freshest and most radical Craft Beer at the Growler Station afterwards! Pops of Brooklyn scores a PERFECT 10 on The Rev Meter. 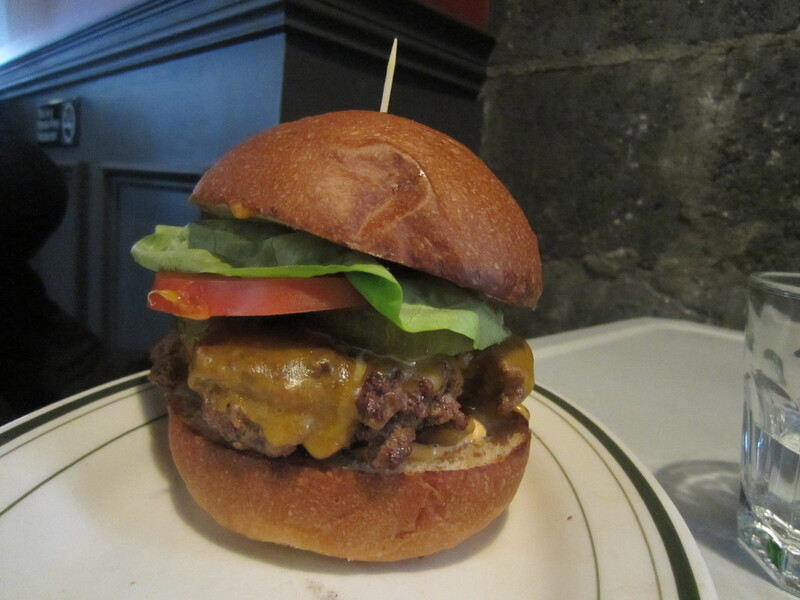 This entry was posted in Burgers, Hamburgers, New York and tagged burger, cheese, ciancio, conquest, french, fries, great, greenwich village, hamburger, new york, ny, nyc, pops, pops of brooklyn, rev, review, the, the rev meter for social community. Bookmark the permalink.